I am trying really hard to make sure there is something to posted here in the text section of the comic. I know it is important and I am pleased with the progress that I am making. I have appreciated the encouragement as well and the excitement over Bean. It has been very nice to see this comic grow and continue to develop over the years. As you might have noticed, I am redoing a few things on the site. I am trying to add a few pages here and there every few days. It takes some time to put the graphics together and get it all posted, but I know in the end it will be worth it. I hope you take a moment to go to the art section. I’ve added new pieces to the original art section of the bean. Which brings me to my next point. I finally found a place to post the covers and preview covers. In fact I have a surprise for you, though I do warn you there are some spoilers if you click on all the covers. We are almost two issues ahead in the printed works, so you might see something that you might want to wait to see. Yet, if you click through I hope you enjoy what you see. I am planning of posting the progress of the piece. I will prob do that with prints as well. I think it adds a new level to the site. Also I will and am blogging about Webcomics on the regular blog. I have found a few kindred spirits and I think their work deserves a little love. As I post about them I hope you take a moment and check them out. I am also posting my feelings about how to make your webcomic successful. This is mainly from my own experience, yet I believe there is value to it, so take a moment to read and let me know what you think. I am a strong believer we can learn one to another. I will be posting this mainly on tues and thursdays, though the will not always be a regular piece. My main goal is to get the other art sections up. Remember if you are doing a webcomic or want to be part of this just click the link above. You can’t nominate your own stuff, and I am not asking for nominations myself. I just think this is kind of pretty cool and something people might be interested in. So if you are go take a gander and have fun nominating your friends, but remember to read the rules first. You don’t want to ruin it. Last but not least, I do hope you are enjoying the 3 page a week updates. It is moving the tale on a little faster. Which is good. Well have incredible day, stay out of trouble and Keep Creating. The one ring was created with malice and the intent to rule all- the sword not so much – Ganadon created the sword out of desperation. Two different weapons. Yet there are some similar traits, there is a bit of madness that dwells in the sword, as with all things weaved. The user uses an item at his own risk and if not careful becomes mad as well. Bean will need to be careful. Then hopefully the sword is a little bit more unselfish then The One Ring. Because it can hurt a lot if that thing keeps you only alive as long as you are usefull for it. I am waiting impatiently what the real powers of the sword are and where it will lead the poor Bean. nice page!! i love how you draw the bubbles when they fall in the water. the effect in the last panel is just great. i loved it on the other page when bean fell in the water and again on this page. i just love how you can tell its this big cloud of bubbles from the surface. you really get the effect. i was gonna mention it before but didn't but i felt the need to now cause it is awesome. thanks aaron- i really tried to make it accurate. 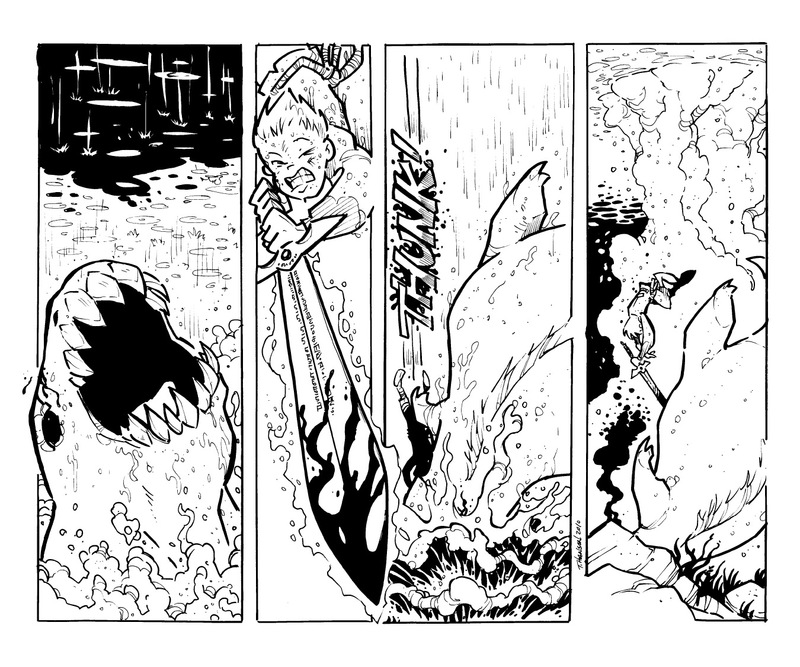 I also wanted to give that last panel a haunting effect and the bubbles just made it work. Poor Bean – I think the sword is doing with him what it likes. Sometimes having a magic sword isn't that funny!